The goal of the employee spotlight series is to help you feel more at home, knowing who may have serviced your apartment and who to look for when you need help. This month, Sarah Green is here to share some information about herself! Sarah does a remarkable job of cleaning your apartment so that it is ready to be turned over (see tips for a successful move out here). 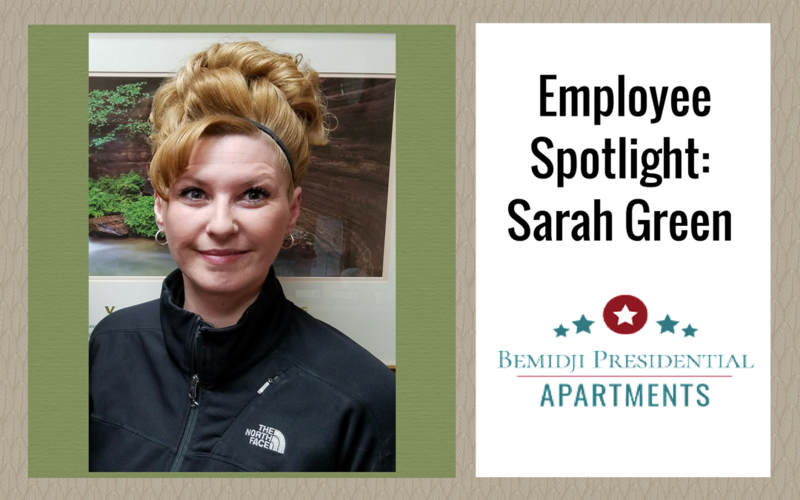 Sarah has been with Bemidji Presidential Apartments since 2005. She is responsible for cleaning entryways, laundry areas, painting, cleaning apartment units when tenants move out, and ordering supplies. She enjoys her job, saying she takes pride in keeping the building clean and friendly. Her tip for tenants? “If you are unsure of anything, please call so we can assist in making you comfortable in your new home.” What a welcoming woman! This quick interview highlighted just how much she desires cooperation and cleanliness in all apartment buildings she services. If you are moving out of your apartment, you can assist her in making a smooth transition. Read these tips for cleaning your apartment so you can get your full security deposit back. At Bemidji Presidential Apartments, we take pride in keeping our properties clean and the excellent staff we have to accomplish that. The next time you see Sarah cleaning a hallway, caring for the entry, or preparing an empty apartment for the next occupants, be sure to say hi and thank her for everything she does to keep your apartment building clean!